(8146912 EMI). GOOD - DISC HAS MINOR MARKS THAT DON'T AFFECT PLAY. HOW MY CD'S AND DVD'S ARE RATED. It all depends on which country you are purchasing from. VERY GOOD - DISC IS CLEAN. RICKY NELSON. EXCELLENT CONDITION (MINT). NEW SEALED 2CD. RICKY NELSON. 56 ORIGINAL RECORDINGS. Be-Bop Baby. Travelin' Man. There Goes My Baby. THE BEST OF. Baby, I'm Sorry. Title: Best Of 2Cd. Artist: "Nelson, Ricky". Format: CD. Condition: New. Number Of Discs: 1. Missing Information?. 11 It's Late. 23 Congratulations. 17 Tryin' to Get to You. 22 Lucky Star. 16 Whole Lotta Shakin' Going on. 13 Shirley Lee. 15 Down the Line. 12 There's Good Rockin' Tonight. Hier folgende 2 CD / Here following 2 CD "Rock" (Rock / Rockpop). Rock englischsprachig. RICKY NELSON. 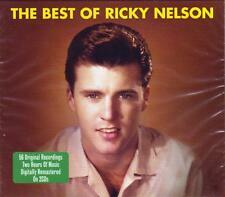 Best of Ricky Nelson - CD. NEW JEWEL BOX. Every CD in this collection. Very clean, very carefully used CD by. was Very Good or Better. The Photo you see is the actual. EX- = 8-9/10 - Slightly worse than EX, possibly just a couple of light brush marks, used but obviously cared for and still in Excellent condition. Eg: EX/EX = First EX refers to the CD, the second EX refers to the Booklet and rear sleeve. Sure, he had more promotional push than any other rock musician of the '50s; no, he wasn't the greatest singer; and yes, Elvis, Gene Vincent, Carl Perkins, and others rocked harder. But Nelson was extraordinarily consistent during the first five years of his recording career, crafting pleasant pop-rockabilly hybrids with ace session players and projecting an archetype of the sensitive, reticent young adult with his accomplished vocals. Eg: EX/EX = First EX refers to the CD, the second EX refers to the Booklet and rear sleeve. We do not grade the plastic jewel cases, as these are easily replaceable. Generally the plastic jewel cases our CDs are sold in are in very good condition or new, you should be able to judge them by the pictures above. DISC: Mint, no scratch crack or slit on CD. MADE IN HONG KONG. Outer Sleeve :Very Good. If the goods is not a quality problem. NEW SEALED 3CD. RICKY NELSON. Travelin' Man. Baby I'm Sorry. There Goes My Baby. THE VERY BEST OF. Young Emotions. Be-Bop Baby. Disc: Like New (Near Mint), Insert: Like New (Near Mint), Case: Generic (New). Not a promotional or white label CD. No cut-out or remainder marks anywhere on the case or insert. The catalog number found on the spine of the disc is 'EDCD 521'. Hello Mary Lou. Milk Cow Blues. I’ve Been Thinking. You’ll Never Know What You’re Missin’. Just A Little Too Much. Trying To Get To You. One Of These Mornings. Never Be Anyone Else But You. Hello Mary Lou. Young World. You Are The Only One. Believe What You Say. Mighty Good. Sweeter Than You. I'm Walkin'. 3 I’m Walkin’ –Fats Domino. 6 Poor Little Fool –Ricky Nelson. 4 Blue Suede Shoes –Carl Perkins. 7 Wake Up, Little Susie –Everly Brothers. CLASSIC HITS OF ROCK & ROLL. 1 At The Hop –Danny & The Juniors. Travelin' Man. Boppin' The Blues. Down The Line. Young World. Mad Mad World. I Need You. You Are The Only One. Everlovin'. 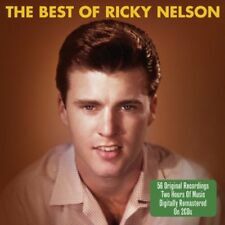 RICKY NELSON - THE BEST OF 2 CD NEW! All CD's of this quality are tested for playability & are fine for ripping to your computer or MP3 player. Condition : ACCEPTABLE - CD has several marks / scratches but no skipping. All CD's of this quality are tested for playability & are fine for ripping to your computer or MP3 player. Teenage Doll. Young Emotions. Boppin the Blues. Down the Line. March with the Band of the Lord. Id Climb the Highest Mountain. You Are The only one. Hey Pretty Baby. RICKY NELSON. 25 GREATEST HITS. 11 It's Late. Hier folgende CD 23 Congratulations. 17 Tryin' To Get To You. 19 My Babe. 22 Lucky Star. Hier folgende 2 CD / Here following 2 CD Young Emotions. Young World. You're My One And Only Love. My One Desire. I Need You. Pop englischsprachig. I'm Not Afraid. Artist:Ricky Nelson. Your item will be previously owned but still in great condition. The disc will play perfectly without interruption and the case, inlay notes and sleeve may show limited signs of wear. Teenage idol. Rick(y) Nelson. The Largest Collection in Germany. Second Hand and New. Title: FOUR CLASSIC ALBUMS (RICKY / RICKY NELSON / RICKY. Artist: RICKY NELSON. Format: CD. Condition: New. ). CD shows no issues that will affect play, jewel case shows some wear. Check out our EBay store for more CDs and vinyl. Ricky Nelson - The Heroes Collection. Title:Ricky Nelson - The Heroes Collection. Artist:Ricky Nelson. All of our paper waste is recycled within the UK and turned into corrugated cardboard. Your item will be previously owned but still in great condition. Case & Booklet Are In Good Condition. RICKY NELSON - VERY BEST OF 3 CD NEW! His records are both varied and inventive, and it all began in 1957 when Ricky, still a teenager, enjoyed his first hit with "A Teenager's Romance". Enjoy this compilation including "Hello Mary Lou", "Poor Little Fool", "Stood Up" and many more! RICKY NELSON - THE RICKY NELSON STORY 4 CD NEW! Honeycomb 8. A Teenager's Romance 3. A Teenager's Romance. In der Zeit von 1957 bis 1962wurden Ricky Nelsons Verkäufe nur von Elvis Presley übertrumpft. Wir präsentieren 100 Songs auf 4 CDs in einer Box mit einem 24-seitigen Booklet, das Linernotes, eine Diskografie und rare Fotosenthält. Artist:Ricky Nelson. Need help?. All of our paper waste is recycled within the UK and turned into corrugated cardboard. Your item will be previously owned but still in great condition. The disc will play perfectly without interruption and the case, inlay notes and sleeve may show limited signs of wear. 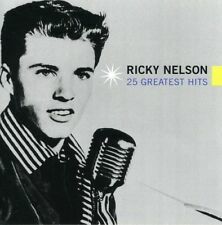 RICKY NELSON '25 GREATEST HITS' CD NEW! Rick(y) Nelson. The Largest Collection in Germany. Second Hand and New. Sweeter Than You. Hier folgende CD / Here following CD You're My One And Only Love. Believe What You Say. Never Be Anyone Else But You. You're So Fine. Boppin' The Blues. Mighty Good. RICKY NELSON - SWEETER THAN YOU-23 GREATEST HITS CD NEW! All the great songs are here. CD on ACE RECORDS by Ricky Nelson - Another Side Of Rick - Perspective. Nelson, Ricky. Another Side Of Rick - Perspective. 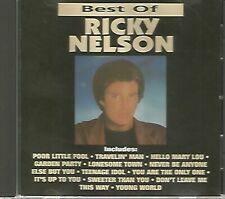 Rick Nelson - Million Sellers/Rick Is 21/Album Seven/It's Up to You (2CD) .